Item is a photograph of Marpole and northern Richmond, looking north. The area photographed centres on the fork of the Fraser River at Sea Island, and runs from W 67th Avenue to Cambie Rd., and from the western most tip of Richmond Island to the west tip of Mitchell Island. 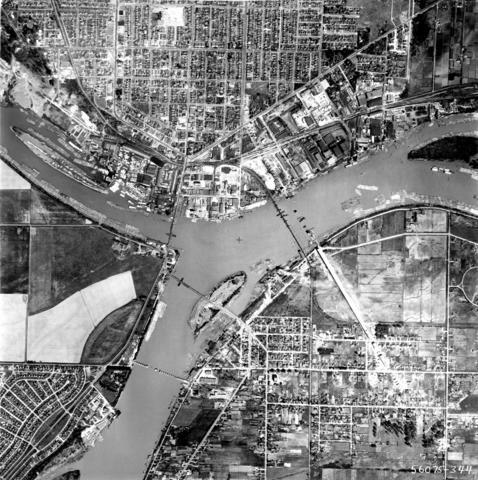 Includes the Marpole Bridge and both Oak Street and Moray bridges under construction. Photograph number: 56075 - 344. "May 1956 Approx Scale 1" = 1000' / Marpole" inscribed on verso in blue pen above a Pacific Survey Corporation stamp.